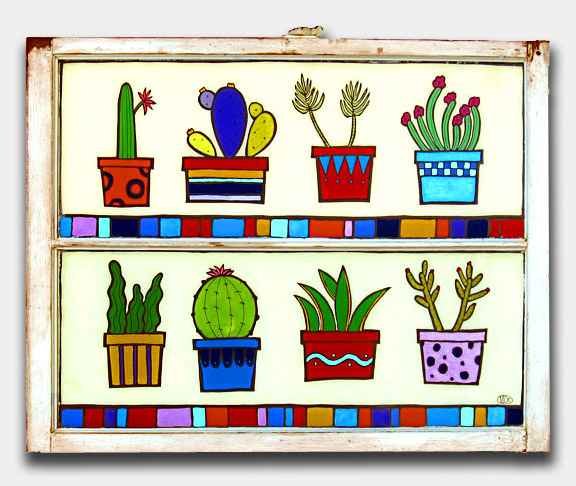 Melinda Curtin, Cacti and Succulents 28" x 36"
Recycling is now a common word in our vocabulary. We recycle paper, glass and certain plastics in a special pail, and we often find that things we buy were once something altogether different, like a floor mat made from old flip-flops! 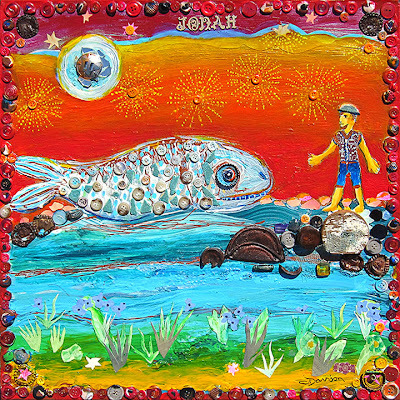 Art also can be made from recycled objects, and the results are pretty creative. The other day, I found a piece of corrugated metal from an old wood icebox in my studio. I started wondering what I could possibly do with it. Probably make an interesting small painting. Or, maybe I could adhere it to a larger piece of wood. Or, maybe stick some small rocks or shells on it. These decisions will require some thought! In the meantime, I decided to check out some of the Wilde Meyer artists who use found objects in their artwork. They seem to know exactly what to do with bits and pieces of stuff! 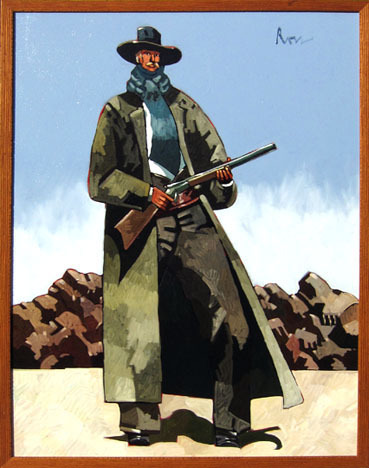 Charles Davison’s work reflects his collecting habit. 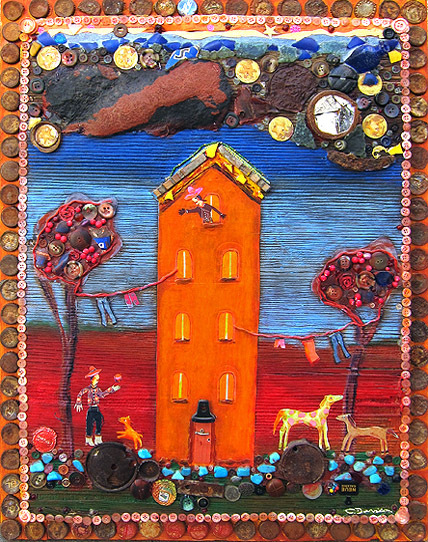 He has a stockpile of buttons, antique jewelry, rusted bottle caps, stones, papers and fabrics that enable him to produce multi-media pieces that are infused with bright color and textures. A self-described pack rat, Charles says that he gets his materials from thrift shops, antique stores, and from things he finds in the desert. 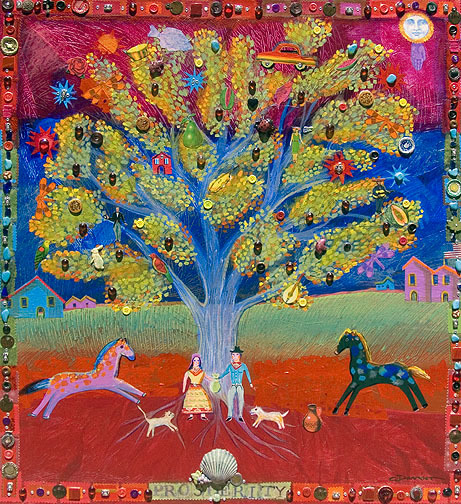 His three-dimensional artwork can be appreciated from a distance, and elicits delight upon closer examination, when you discover what materials are in the paintings. 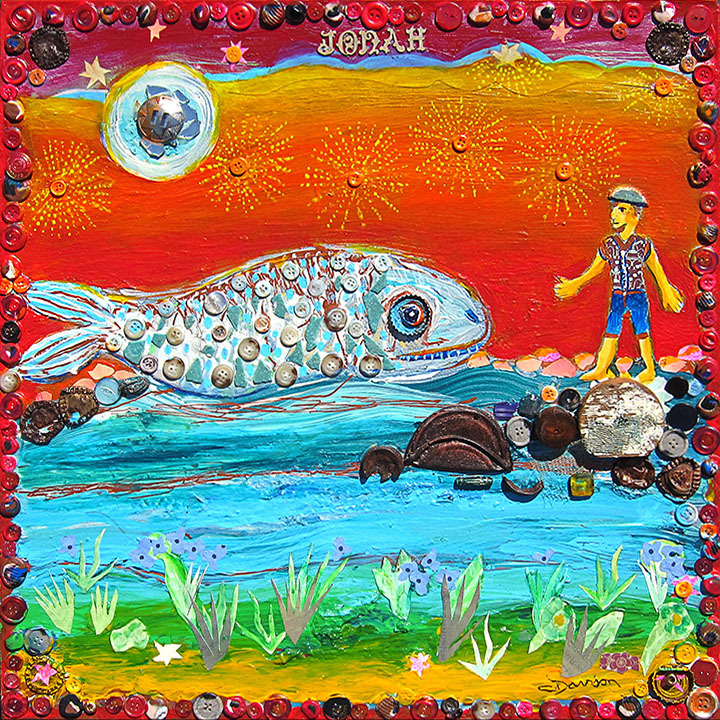 Charles Davison, Jonah's Tale, 20"x20"
For example, in his painting entitled “Jonah’s Tale”, Jonah is standing atop different found materials, looking at a huge fish encrusted with buttons. Behind the watery shoreline, a bright orange background is made from what looks to be an embroidered Indian fabric, perhaps a sari in an earlier life. 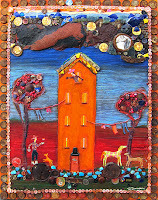 The sun is made of several found objects, and the entire piece is framed in buttons. 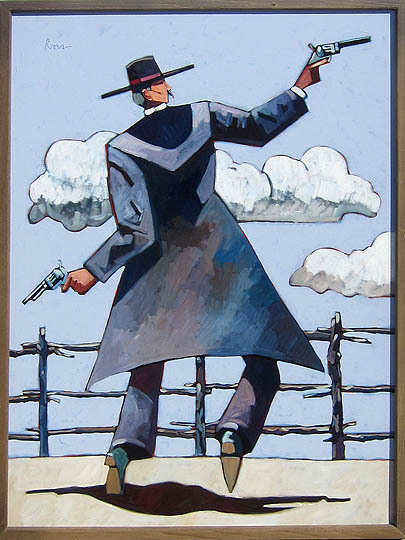 Charles Davison, Calling up the Moon, 56"x56"
Charles says that his collection often gives him ideas for paintings. 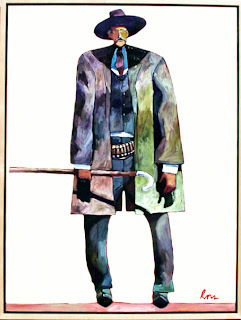 Or, he may have an image in mind, and then delves into his huge inventory to find just the right objects. 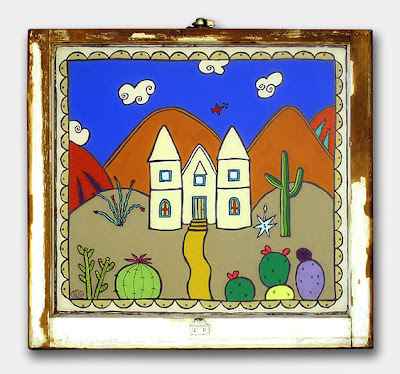 Rusted metal objects, wooden stars and decorative house moldings all play roles in different paintings. 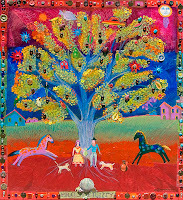 Some objects are glued on with epoxies; others are sewn on. “Calling Up the Moon” is a work that took him four years to complete. 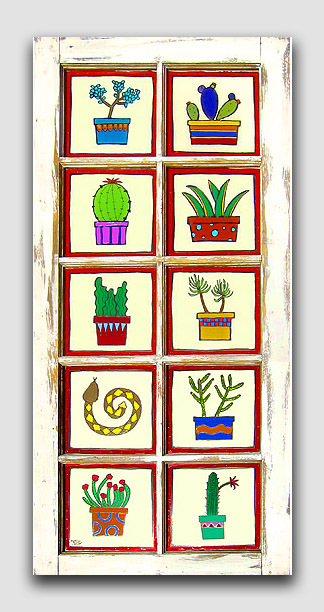 It features miniature dishes, semi-precious stones, beadwork and appliqued fabrics. 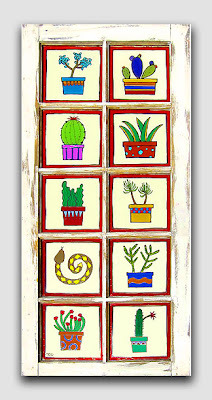 Melinda Curtin, Party Dogs in the Pueblo 28" x 36"
Melinda Curtin, Snake and Cacti 57" x 27"
She lives in Tucson, and her work has a southwestern influence. Her technique for painting on glass is challenging, since she has to paint in reverse. She told me that she has to paint the details first, and then add the main image on top. “You have to think backwards, “she said. 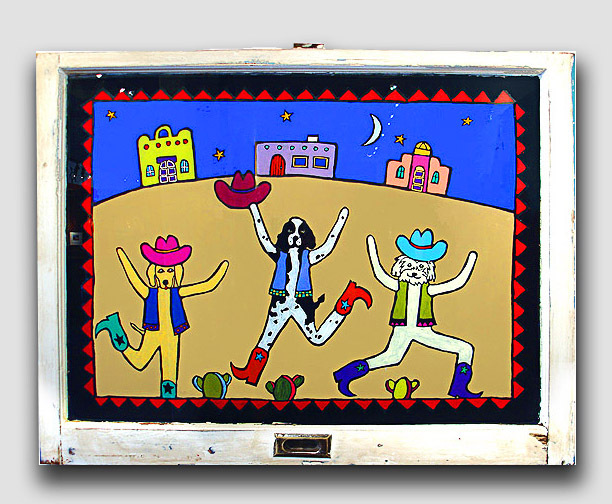 “The details you would normally do last, you have to paint first.” Her painting, “Party Dogs in the Pueblo,” is painted on a window with its original hardware intact. It’s typical of her style, with bright colors; flat, playful images and a southwestern theme. 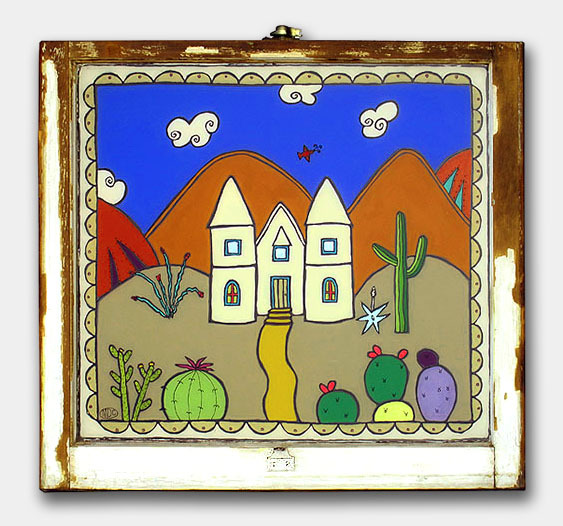 Melinda Curtin, Casa Sedona 28" x 30"
“Casa Sedona” also has a weathered frame and old hardware, with the bright blue sky, cacti and simple subject rendering she favors. Things got a little more complicated in “Snake and Cacti,” since she had to work on a 10-panel window, and unite the 10 different images by theme and color. I can see that using old materials for new art requires quite a collecting habit, a great deal of imagination and a bit of humor. Now what can I do with that piece of corrugated metal (and my old button collection)?? 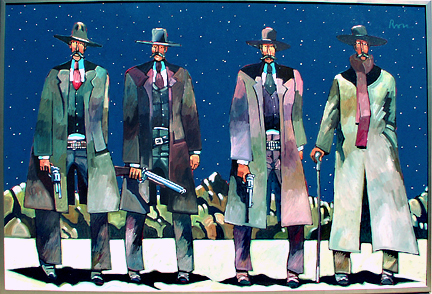 Myths and truth are the narratives that run through the distinctive paintings by Thom Ross. In his art, Thom paints famous Western characters in a distinctive way that tells a more complex story than the traditional historical myths we have come to know. 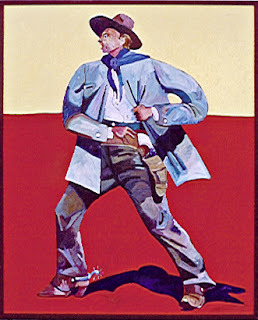 “I’m a storyteller who paints,” he says. 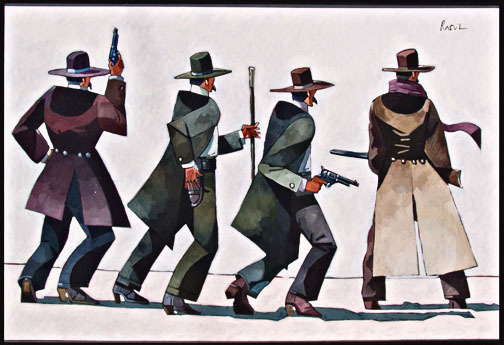 The Gunfight at the O.K. 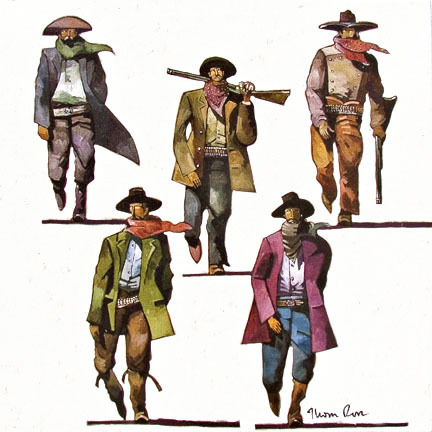 Corral was a gunfight that took place at about 3:00 p.m. on Wednesday, October 26, 1881, in Tombstone, Cochise County, Arizona Territory, of the United States and which is generally regarded as the most famous gunfight in the history of the American Old West. 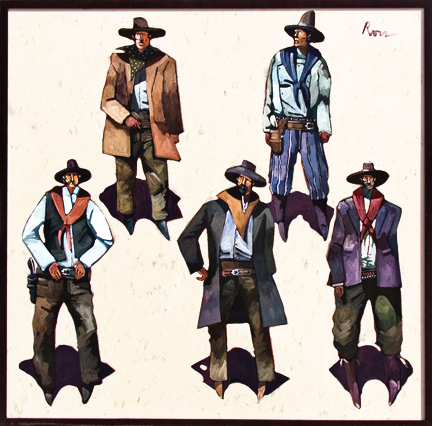 The gunfight, believed to have lasted only about thirty seconds, was fought between the outlaw Cowboys Billy Clanton, Tom McLaury and his brother Frank McLaury, and the opposing lawmen Virgil Earp and his brothers Morgan and Wyatt Earp, aided by Doc Holliday acting as a temporary deputy of Virgil. Cowboys Ike Clanton and Billy Claiborne ran from the fight unharmed, but Ike's brother Billy Clanton, along with both McLaurys, were killed. 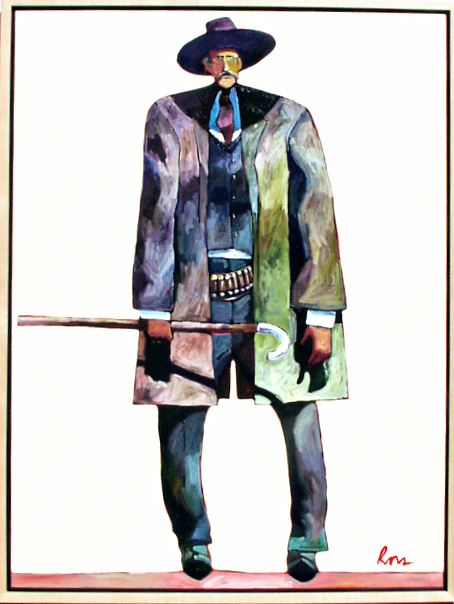 Lawmen Holliday and Morgan and Virgil Earp were wounded. 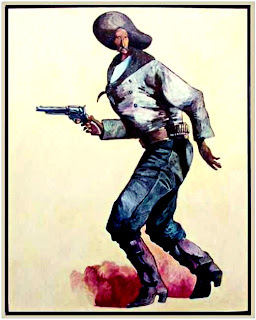 Only Wyatt Earp came through the fight unharmed. The fight has come to represent a time in American history when the frontier was open range for outlaws opposed by law enforcement that was spread thin over vast territories, leaving some areas unprotected.